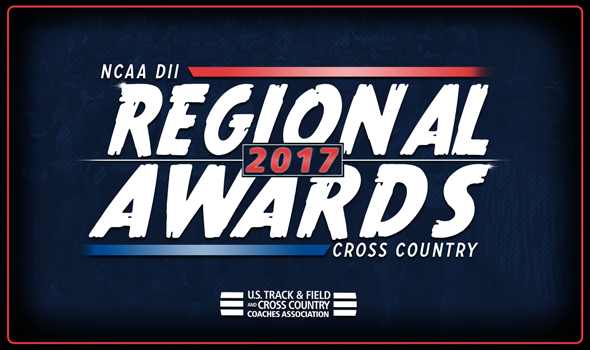 NEW ORLEANS – Regional Athletes and Coaches of the Year for the 2017 NCAA Division II Cross Country season were announced Wednesday by the U.S. Track & Field and Cross Country Coaches Association (USTFCCCA), as voted on by member coaches from that division. More information on each of those winners can be found below. Moser, a sophomore from West Chester, Pennsylvania, won the Atlantic Region title with a time of 30:51.4. He placed seventh at the PSAC Championships. This is the first time a male athlete from Shippensburg has been named Athlete of the Year in the Atlantic Region. Phillips, a sophomore from Bailey, Colorado, took home the Central Region title, finishing in 31:12.7. He was undefeated on the year, winning all five meets in which he competed, including the NSIC Championships. Kipkosgei, a junior from Kapsabet, Kenya, won four of the five meets in which he competed this season, including the East Regional, where he finished in 32:38.8. He also captured the Northeast 10 XC Championship. This is the second year in a row that Kipsoegi has been named Men’s Athlete of the Year in the East Region. Ngandu, a senior from Nakuru, Kenya, was undefeated on the season, winning the GLIAC Championship and the Midwest Region title. He won both races by more than 10 seconds each. This is the second year in a row that Ngandu has been named Men’s Athlete of the Year in the Midwest Region. Cheserek, a sophomore from Kitale, Kenya, won four meets on the season, including the Sunshine State Conference and South Region titles. Cheserek has won the last two individual titles at the Sunshine State Conference Championships. Ramirez, a senior from Santa Ana, California, won the South Central Region title with a time of 30:38.5. He was also a runner-up at the 24th Annual Joe I. Vigil Open. Kipkoech, a freshman from Eldoret, Kenya, won five out of the six races in which he competed on the season. He won the Southeast Region individual title with a time of 31:23.6 and also captured the Peach Belt Conference crown. Ribich, a senior from Enterprise, Oregon, won all three meets in which he competed on the season. Ribich captured the GNAC Championship before winning the West Region title with a time of 29:49.2. Friend, a senior from Markleysburg, Pennsylvania won the Atlantic Region title in 20:36.7. She also won the individual title at the PSAC Championships. Zeis, a senior from Bismark, North Dakota, won the Central Region title in 20:53.5. That was her fourth individual title on the season, which also includes victories at the NSIC Championships and the Roy Griak Invitational. This is the third year in a row that Zeis has been named Women’s Athlete of the Year in the Central Region. Knox, a senior from Worcester, Massachusetts, won the East Region title in 22:43.6. She also won the individual title at the Northeast 10 Championships. Berger, a junior from Wadsworth, Ohio, won the Midwest Region title in 21:19.3. She also won the individual title at the G-MAC Championships. Colett Rampf, a senior from Premnitz, Germany, won the South Region title in 20:49.2. She is undefeated this season and won her fourth consecutive individual title at the Sunshine Conference Championships. This is the third year in a row that Rampf has been named Women’s Athlete of the Year in the South Region. Grover, a senior from Salinas, California, won the South Central Region title in 21:03.6. She placed third at the RMAC Championships in October. Hanle, a sophomore from Lichtenstein, Germany, won the Southeast Region title in 21:15.5. She also won the individual title at the Conference Carolinas Championships. Kurgat, a senior from Eldoret, Kenya, won the West Region title in 20:26.1. She also won individual titles at the GNAC Championships and the Lewis Conference Crossover. Spence, in his 20th year at Shippensburg, won the Atlantic Region championship with a meager 35 points. The Raiders also took home the team title at the PSAC Championships. Hellman, in his 17th year at Augustana (S.D. ), won the Central Region championship with 43 points. He also led the Vikings to an NSIC team title. This is the sixth year in a row that Hellman has been named Men’s Coach of the Year in the Central Region. Boen, in her 20th year at Stonehill, led the Skyhawks to an East Regional title, winning with 39 points. Her squad also took home the Northeast-10 title. Mizicko, in his sixth year at Walsh, led the Cavaliers to a fourth-place finish at the Midwest Region Championships. Walsh also captured the G-MAC title under Mizicko’s watch this season. Morgan, in his fourth season at Lee (Tenn.), guided his program to a South Region championship, scoring 82 points. Morgan and the Flames also won the team title at the Gulf South Championships. Martin, in his 23rd year with the program, coached his men to a South Central Region title, scoring just 35 points. His Grizzlies were the runner-up at the RMAC Championships. This is the fifth time in the past six years that Martin has been named Men’s Coach of the Year in the South Central Region. Van Lierop, in his ninth year at Mount Olive, led his team to a Southeast Regional championship with 50 points. The Trojans also captured the team title at the Conference Carolinas Championships. This is the third year in a row that Van Lierop has been named Men’s Coach of the Year in the Southeast Region. Towne, in his 22nd year at Chico State, guided the Wildcats to a West Region title, notching just 55 points. The Wildcats also took home the CCAA title under Towne’s tutelage. Foster, in his second year at Edinboro, led his team to the Atlantic Region title. The Fighting Scots scored 67 points to capture the crown. Foster also guided his squad to the team title at the PSAC Championships. Newell, in his 12th year at U-Mary, led his team to the Central Region title. The Marauders scored 61 points to outdistance the rest of the field. Newell also guided his squad to the team title at the NSIC Championships. Baltzell, in his first year at Assumption, led his team to the East Region title. The Greyhounds won the crown by one point over Stonehill. Baltzell also guided his team to a runner-up finish at the Northeast-10 Championships. Baltes, in his 19th year at Grand Valley State, led his team to the Midwest Region title. The Lakers captured the crown with 46 points. Baltes also guided his squad to the team title at the GLIAC Championships. Reiber, in his third year at Saint Leo, led his team to the South Region title. The Lions captured the crown with 78 points. Reiber also guided his squad to a runner-up finish at the Sunshine Conference Championships. Martin, in his 30th year at Adams State, led his team to the South Central title. The Grizzlies captured the crown with a meager 26 points. Martin also guided his squad to the team title at the RMAC Championships. This is the fifth time in the past six years that Martin has been named Women’s Coach of the Year in the South Central Region. Licht, in his first year at Queens (N.C.), led his team to the Southeast Region title. The Royals captured the crown thanks to a 76-point output. Licht also guided his squad to the team title at the SAC Championships. Gall, in his sixth year at Cal Baptist, led his team to the West Region title. The Lancers captured the crown with 68 points. Gall also guided his squad to the team title at the PacWest Championships.